The Richmond-Connersville-New Castle (RCNC) area economy is sputtering given its interdependence with the national economy. The sluggish recovery is spilling over into the local economy in terms of employment, income, and growth. The manufacturing sector continues to be affected in varying degrees by current economic conditions. Firms producing durable goods, such as wire, machine tools, heavy-duty truck parts, and other transportation-related equipment, have weak demands and below target sales. The machine tool industry has overcapacity and a lack of capital spending. Also, the new emission requirements for diesel truck engines translate into low new orders. Consequently, some firms have laid off employees, while others have maintained employment levels expecting to have a good year. The rebates and zero or low interest rate financing offered by DaimlerChrysler, Ford, and General Motors are helping the automobile industry. Sales of both 2002 and 2003 model vehicles are at a robust pace, which helps to cushion the severity of the economic slump. With lean inventories and a fairly optimistic industry outlook, auto makers expect a turnaround. Most manufacturers, however, expect orders, production level, investment, and employment to either increase or stay the same during the first half of 2003. They foresee little change in most indicators before the end of 2002. On a positive note, Grand Vehicle Works of Union City reported that its subsidiary, Workhorse Customs Chassis, plans to manufacture diesel chassis for recreational vehicles in the closed Dana plant in Hagerstown. The company plans to make an initial investment of at least $3 million, which will create 100 new jobs at an average wage rate of $10.50 to $13.00 an hour for nonsalaried workers and $51,000 a year for salaried workers. This investment will give a tremendous boost to Hagerstown and the surrounding communities. Employment growth in Wayne, Fayette, and Henry counties was slow in 2001 and 2002 (see Figure 1). In September 2002, the numbers of employed workers were 34,040 in Wayne, 9,310 in Fayette, and 22,520 in Henry, and the unemployment rates were 4.8 percent, 7.6 percent, and 5.1 percent, respectively. These unemployment rates were higher than the state rate of 4.6 percent but below the national rate of 5.4 percent, with the exception of Fayette County (see Table 1). Fayette County continues to experience high unemployment given its manufacturing intensity vis-à-vis the sluggish recovery. It is important to note that of all the employment categories, manufacturing continues to have the most significant impact on the local economy because of its high average wage rates. Income declines in manufacturing affect total local income. On the bright side is the housing sector. There is strong growth as evidenced by new subdivisions and home improvements. There were 3,099 building permits in RCNC during the first nine months of 2002 with an estimated investment value of $119.2 million. In Richmond, there were 1,164 permits, of which 30 were residential and 8 were commercial, with an investment value of $8.3 million. The overall investment value is estimated at $18 million which is much lower than last year (see Table 2). The drop in mortgage rates from a peak of 8.7 percent in May 2000 is making home buying more affordable. At the end of October, local financial institutions had 15-year, 30-year, and 1-year adjustable mortgage rates averaging 5.48 percent, 6.16 percent, and 4.52 percent, respectively (see Table 3). Rates for fixed mortgages remain near historic lows, allowing home buyers and people refinancing their homes favorable mortgaging financing terms. There is increased activity for homes priced between $75,000 and $120,000. Also, some upscale movement is occurring between local and new residents for homes priced at $200,000 and above. An increase in home buying always lifts consumer spending for home-related goods and services. Home buyers seem to be forward looking by taking advantage of current mortgage rates. They expect mortgage rates to edge up when financial markets incorporate higher inflation. Inflation is currently subdued. But low interest rates could be a symptom of deflation that could have far-reaching consequences for households awash in debt. A fall in the price level raises the real amount of debt and redistributes wealth between debtors and creditors. Like housing, the service sector is growing. RCNC's health care services, business services, and management services are not as adversely affected by current conditions as manufacturing. As the service sector expands, it will stimulate employment and income in the region with spillover effects on food and entertainment outlets. Personal income in RCNC showed a slight increase of 5.5 percent in 2000. 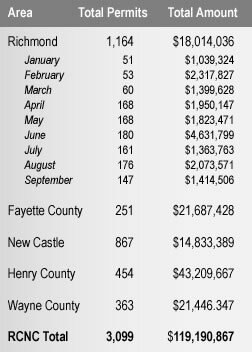 The per capita personal incomes for Wayne, Fayette, and Henry counties were $24,839, $23,412, and $25,345, respectively. Per capita personal income remained below the state level of $26,933 and the national level of $29,469. The recession that began in March 2001 has reduced income growth. Nominal per capita income growth for the U.S. as a whole last year was less than half the pace set in 2000. Furthermore, in its annual survey of local firms, the Center for Economic Education found that 93 percent of the firms are adversely affected by current economic conditions, 59 percent have hired new employees in 2002, 33 percent plan to expand in 2003, 53 percent do e-commerce, and 40 percent rate the education level of their workforce as good. Only 58 percent of the firms are optimistic about 2003. This could change since the midterm elections are over, but there are still financial and political uncertainties, especially if there is another Gulf war. Overall, the fundamentals are in place for RCNC to have an uptick in economic activity in 2003. Growth could be uneven due to swings in capital spending, consumer confidence, and other transitory developments. This forecast depends on economic conditions at both the national and international levels.